Pit Bull Dogs are very active and athletic dogs. They have an unlimited supply of energy and can play for long hours without tiring. 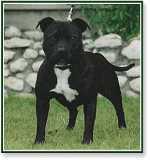 You will seldom find Pit Bulls resting in a shade for a long period of time, but you will often see one that is running and jumping around with the passion and enthusiasm that only Pit Bull dogs can have. You need to take certain precautions to make sure that your Pit Bulls exercise is both fun and safe. You should always have him wear a leash whenever you take him outside. Regardless of how smart or trustworthy he is, he should never be allowed to go off-leash unless he is in your yard and surrounded by a tall and sturdy fence. When excited, even the smartest and the most trustworthy of dogs will sometimes forget their training for just a moment, which is all it takes to scare other people, run in front of traffic, or run away altogether. You should never let your Pit Bull dogs run free in public places. No matter how gentle and friendly he is, he could be perceived as a threat or a nuisance, especially for those who have a prejudiced opinion against his breed. Furthermore, many places prohibit dogs, especially dogs that are off their leash. And if your Pit Bull Dogs are not wearing a leash and an accident happens that involves another human, you are morally and legally responsible for it. Having the potential of endangering your dog’s life and possibly endangering another human being is not worth letting your dog run around without a leash. There are great ways of giving your Pit Bull their exercise, while keeping him on a leash. Taking him for a walk is an excellent low-impact exercise for both you and your dog. You can start with a short walk and then gradually work your way up to longer distances. An adult Pit Bull should get a minimum of half a mile of daily walking, and of course more is always better. Pit Bull puppies should never be walked long distances because too much walking can damage their developing bones. Older dogs and obese dogs should not be forced to walk farther than they can comfortably handle. Jogging is another fun exercise you can do with your dog. However, you have to work up to longer distances gradually. As a safety measure, avoid jogging with your dog during hot weather. Pit Bulls are not built to be marathon runners; they cannot cool themselves as well as humans can and might suffer from heatstroke. Also avoid jogging your dog on hard surfaces which are bad for their joints. Always check the footpads for abrasions, tearing, gravel, or blistering from hot concrete. During winter, check in between the pads for balls of ice.